So You Want to Get Fired? In the last post, I looked at how coaches performed as underdogs and favorites, not Against the Spread (ATS), but in terms of actually winning or losing on the field. Feel free to read that post as a primer to this one. At the end of that post, I promised an additional post on the ‘portability’ of this ‘skill’. Instead I want to focus on a few other coaches in great detail. We’ll save the portability aspect for the next post. 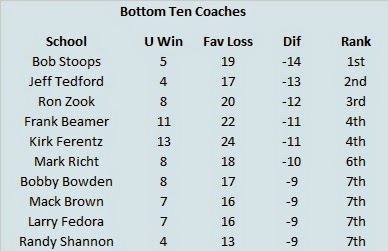 In the previous post, I shared with you the bottom ten coaches in terms of wins below expectation according to the spread. Five of the coaches on the list were fired, forced to resign, or gently nudged out the door. Four others enter the 2015 season either under intense or moderate scrutiny based on their recent job performance. Thus, I theorize that coaches who vastly underperform according to the number of games they would have been expected to win based on the spread who are also lacking in the conference or national title department will be good candidates to be fired. To test this, I again calculated the most underperforming coaches in the ten-year period from 2005 through 2014 who also lacked either a conference or national title. If a coach tied for a conference title, I only gave him the benefit of the doubt if his team garnered the conference's automatic BCS bid. Those gentlemen are listed below. Not to pat myself too hard on the back, this method is pretty accurate in determining who will be fired. Of the 13 coaches on this list, all save Kirk Ferentz (and his voodoo magic) and Kevin Sumlin have been fired (Ferentz did tie for the Big 10 title in 2002 and 2004 but did not lead Iowa to a championship from 2005-2014). I already gave brief overviews of Tedford, Zook, Ferentz, and Shannon in the last post, so I’ll move on to the other nine coaches. Initially I was not a fan of Pelini’s firing by the Cornhuskers, but viewed in this light it is hard to argue with. In seven seasons, Pelini only sprung four outright upsets, and lost twelve times as a favorite. Despite winning at least eight games in the regular season during each year of his tenure, his firing was probably justified. Watson Brown (Mack’s brother, it runs in the family) coached UAB for just two seasons in this study, and lost nine times as a betting favorite. His 2005 team, led by quarterback Darrel Hackney was an underdog in an early season game to Tennessee and in two conference games, but was favored in each of their other contests…and finished only 5-6. Houston Nutt got Arkansas to the SEC Championship game in 2006 and engineered a huge turnaround in his first season at Ole Miss, but lost nine times in four seasons as a favorite in Oxford. Kevin Sumlin lead Houston to a pair of Conference USA Championship Game appearances in his four seasons at the school, but lost both times as a large favorite. Gregg Brandon took over for Urban Meyer at Bowling Green, and while he did lead the Falcons to a division title in his first season, he could not replicate that initial success. He was fired after six seasons despite a 44-30 record because according to the oddsmakers he should have won about 50 games. In just three and a half seasons, at a school not known for elite football teams (since the 1960s), Tim Brewster managed to lose nine times as a favorite. Lane Kiffin was famously fired on the tarmac after an embarrassing defeat at the hands of Arizona State. At least the Trojans were not favored in that game. Noted maniac John L. Smith lost nine times as a favorite in just three seasons. If we examine more of his career, I can only assume his resume would be even more egregious. Dave Wannstedt did return the Pitt program to respectability, but he was never able to win a conference title in the watered down Big East. Judging by the small margin by which Pitt lost the 2008, 2009, and 2010 races, his inability to close out games in which he was favored exacerbated his demise. Before we go, I’ll discuss a few other coaches who did not make the list. Bill Blankenship won Conference USA at Tulsa in just his second season, but lost six times over the next two years as a betting favorite and was let go. Urban Meyer won just a single regular season game as a betting underdog at Florida (and lost ten times as a favorite). At Ohio State, he already has three times as many underdog wins, not counting the College Football Playoff. Nick Saban has lost ten times as a betting favorite at Alabama. He has just four underdog wins, primarily because has only been an underdog once since the beginning of the 2009 season. Rich Brooks pulled off ten underdog wins as Kentucky’s coach from 2005-2009 against just four defeats as a favorite. That’s all for now. In the next post, I promise, we’ll cover portability. I have made no secret on this blog of my affinity for Bill Snyder. I always enjoy watching his Kansas State teams and his second tenure has included two of the more surprising elite seasons in college football history. The statement has been made by numerous pundits and fans alike that he ‘does more with less’. That’s a nice platitude, but what does it mean? One way to measure doing more with less would be to compare recruiting rankings with wins and objective power rankings to see which coach has done the most with the least talent. Alas, that has been done before. Plus, just because athletes are lightly regarded does not mean they can’t play football. Perhaps coaches like Snyder have a keen eye for unpolished talent or ‘diamonds in the rough’. In the interest of doing something original, I decided to look at another way a coach might get the most out of the talent at their disposal, and like most of the posts on this blog, it involves the point spread. The point spread is often a pretty good indicator of which team is ‘better’. For starters, it takes a great deal of information into account (game site including weather and homefield advantage, perceived talent level of the two teams, injuries, etc.) and is subject to market forces. It the ‘smart’ money thinks the point spread is ‘off’, the number will be adjusted either up or down in order to minimize the bookmaker or casinos potential loss. With that in mind I decided to look at all regular season games since 2005 (ten years), determine which team was the favorite, and in the case of a point spread ‘upset’ award each coach either an ‘Underdog Win’ or a ‘Favorite Loss’. Is this method a perfect gauge of how good a coach is? Of course not. Here are a few strengths and weaknesses. The main strength of this method is that it adjusts for new information. While a team might be undervalued in the preseason, a few upset wins will mean the oddsmakers and general public will start to view them as a strong team. Take for example Kansas in 2007. The Jayhawks came out of nowhere to win eleven regular season games, play in the Orange Bowl, and finish ranked in the top ten. Mark Mangino deserves a great deal of credit for such an accomplishment at a non-traditional power. Before the season started, anyone proclaiming Kansas to win eleven games would likely be thought a fool and exiled to Patmos. However, once the season began, Kansas proved to be better than expected and their schedule was not nearly as daunting as one would expect from a major conference team. Consequently, Kansas was only an underdog twice in the regular season. Kansas won one of those games, so they only finished one game better than their implied record based on the point spread. One problem with this method is that it treats each game the same in terms of win probability. A coach that is a field goal underdog is given the same reward as a coach that is a touchdown underdog. A better system would assign portions of wins based on the point spread. I am very lazy, but if you would like to do that, have at it. Another issue with this system is that it underrates coaches at traditional powers. Nick Saban has not been an underdog at Alabama since 2009. Saban is unlikely to rank very high on this list since he is rarely an underdog. Similarly, coaches that toil at non-traditional powers might be overrated here. Since they are often underdogs, they will have more opportunities to pull off upsets. Perhaps a better method would be ‘Underdog Win Percentage’ or ‘Favorite Loss Percentage’. Once again, I am lazy. Feel free to do this research on your own. 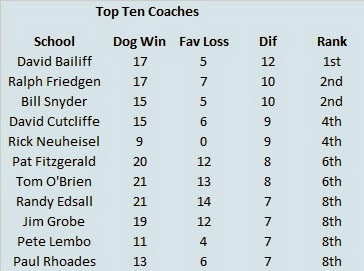 With those disclaimers out of the way, let’s look at the top ten coaches in terms of biggest net difference between underdog wins and favorite losses. The leader in this category is likely a surprise. I suspect most college football fans could not pick David Bailiff out of a lineup. However, he has accomplished quite a bit at Rice, a non-traditional power. In fact, non-traditional power is putting it nicely. Rice was very bad for a long time, but in his eight seasons at the school, Bailiff has guided the Owls to four bowl games, two ten-win seasons, and a conference title. My main man Bill Snyder comes in second place tied with former Maryland head coach Ralph Friedgen. I always thought Friedgen was underrated and the Terps were wrong to let him go. This of course, does not confirm that empirically, but it does confirm it in my biased opinion. In addition, Friedgen’s three best years are not even included in this examination. From 2001-2003, Friedgen led the Terps to an ACC title and a trifecta of ten-win seasons. David Cutcliffe, the architect of the Duke renaissance ranks fourth. He is tied with Rick Neuheisel, perhaps the most surprising entrant on this list. Neuheisel never lost a game he was favored in during his time at UCLA, but he was obviously not favored in enough to hold onto his job. Pat Fitzgerald has kept Northwestern in bowl contention for nearly a decade and Tom O’Brien did just enough to make the natives restless at two different schools. Randy Edsall did most of his heavy upset lifting at UConn, where he led the Huskies to the Big East title in 2010. Jim Grobe is probably the most successful head coach my alma mater has ever seen (unless you want to make an argument for Peahead Walker). Pete Lembo won consistently at Ball State for four years, and I am as surprised as anyone that he has not moved up to a Power 5 job. Finally, Paul Rhoades has pulled off some of the biggest upsets of the last decade, and that is part of the reason he remains employed despite just one winning campaign during his six-year tenure in Ames. Now we come to the other side of the coin. For every underdog that wins, there is a favorite that loses. These coaches have been among the most prolific losers as favorites. ‘Big Game’ Bob tops the list. I am by no means insinuating that Bob is a bad coach, but with the Sooners failing to meet expectations over the last few seasons (they have not won an outright Big 12 title since 2010), you can see why rumors were circulating about his impending departure from Norman this offseason. Be thankful for what you have Sooner fans. Need I remind you of the Gomer Jones or John Blake eras? 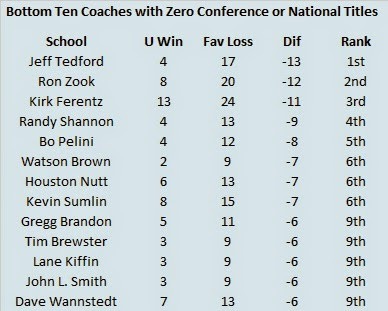 I was shocked by Jeff Tedford’s appearance on this list. He brought the Cal Bears to great heights during his tenure, but as you can tell from the high number of losses as a favorite, he probably should have won a few more times. Next up is Ron Zook. Keep in mind this does not include his ill-fated tenure at Florida when he succeeded Steve Spurrier for three seasons from 2002-2004. No, The Great Zooker lost 20 times as a favorite at Illinois! in seven seasons. Like Bob Stoops, Frank Beamer is another long-tenured coach without a league title in the last half-decade who is also feeling a little heat from the fans. Kirk Ferentz has been at Iowa seemingly since it became a state in 1846. While he has often been the subject of NFL rumors, Ferentz continues to coach the Hawkeyes to both bowl games and inexplicable losses. Mark Richt is perhaps one of the best coaches to have never won a national title, but his last SEC championship was in 2005 and like Stoops and Beamer, his seat is becoming a little warmer. Bobby Bowden was forced out retired following the 2009 season, so his 17 losses as a favorite took place over just five seasons. Mack Brown, like Bob Stoops, oversaw a program rich in resources and found his team the favorite the majority of the time the Longhorns took the field. Larry Fedora has been an underachiever at two places. He did guide Southern Miss to the 2011 Conference USA title, and while that is one of the better teams in school history; they did manage to lose twice as double-digit favorites. Randy Shannon was shown the door at Miami after just four seasons, and with 13 losses as a favorite, it is not hard to see why. That is all the damage I can do in this post. Check back in a week or so when I examine if this ‘Upset Ability’ is portable and explore in detail some other coaches who didn't quite make the Best or Worst Of lists.